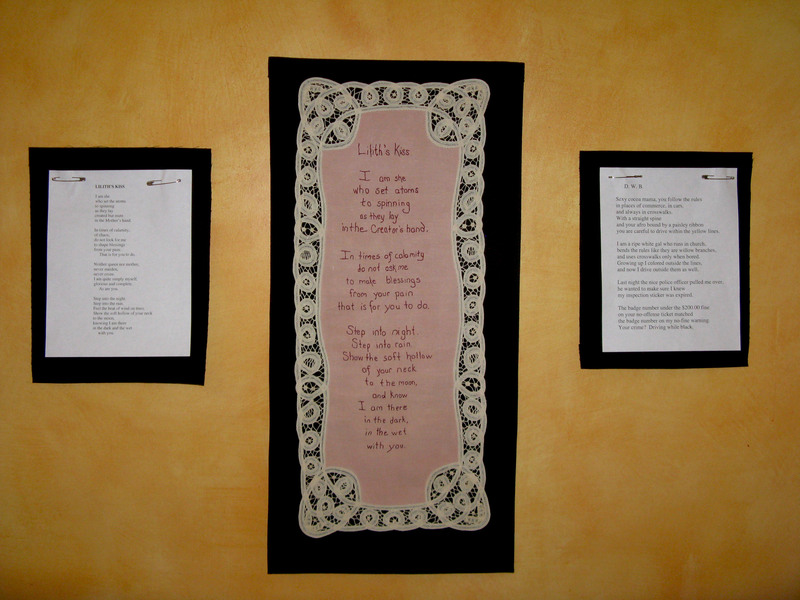 While The Linens Project is my vision and my poetry, I am by no means the only artist involved, and this project could not happen without the work of others. Those who originally created these pieces were incredible artists, whose work is both intricate and beautiful. Every time I sit with a new piece I am humbled by the skill required to create it. 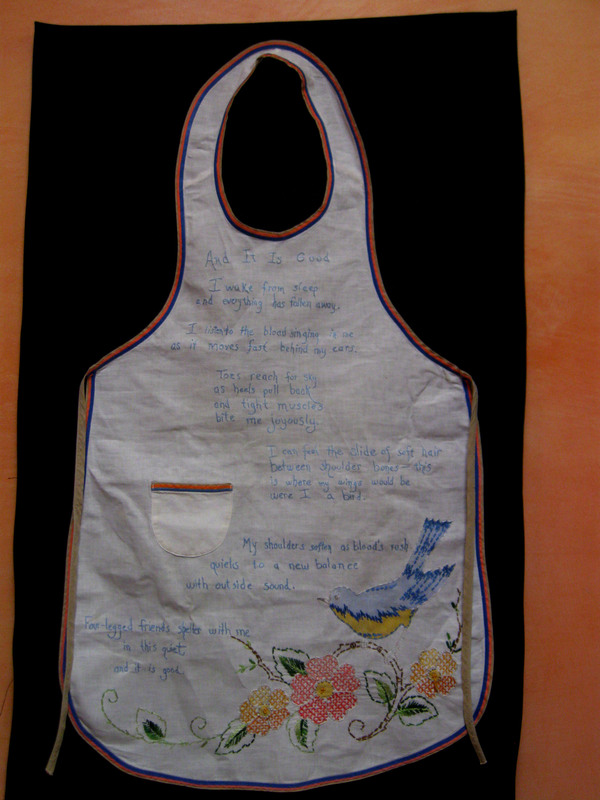 And those friends who embroider the poems are also artists, they do far more than “just” embroider words. Every new piece involves an initial conversation between myself and the person who is going to embroider it–they play an important role in deciding how the piece will eventually look–this is a process of co-creation. And in my haze of getting this show up for the first time two years ago I failed to include in the photograph of “Lilith’s Kiss” any of the names of the other women who made this piece. I deeply regret this error. 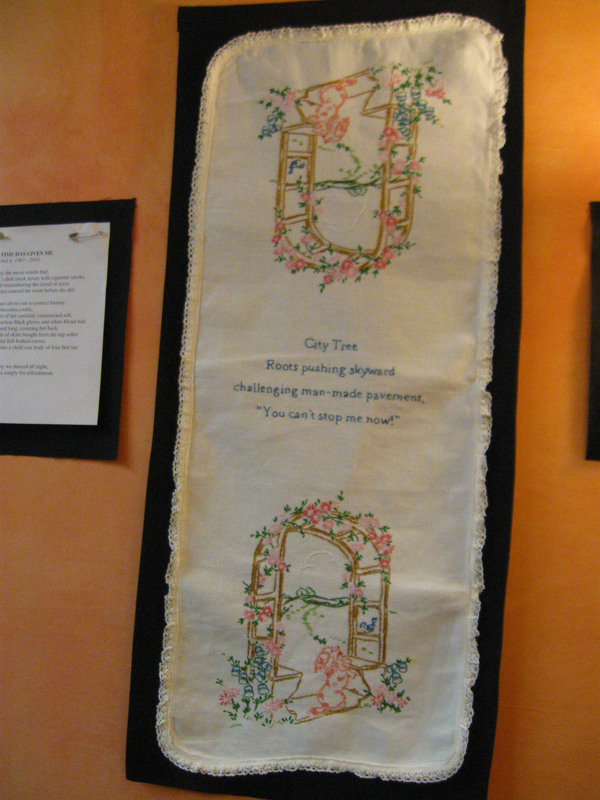 The table runner was donated by my Wendi Weinberg. This is a treasured family piece, made Wendi’s grandmother Hortense Morrison. When Wendi gave me this table runner it had been carefully, lovingly cared for, and Wendi gave it to me because she wanted to see it be a part of The Linens Project. I chose the poem (some might say the prayer) in part because Lilith comes out of the Jewish spiritual tradition, and Hortense Morrison was Jewish. It is an honor to have this work included in the show. 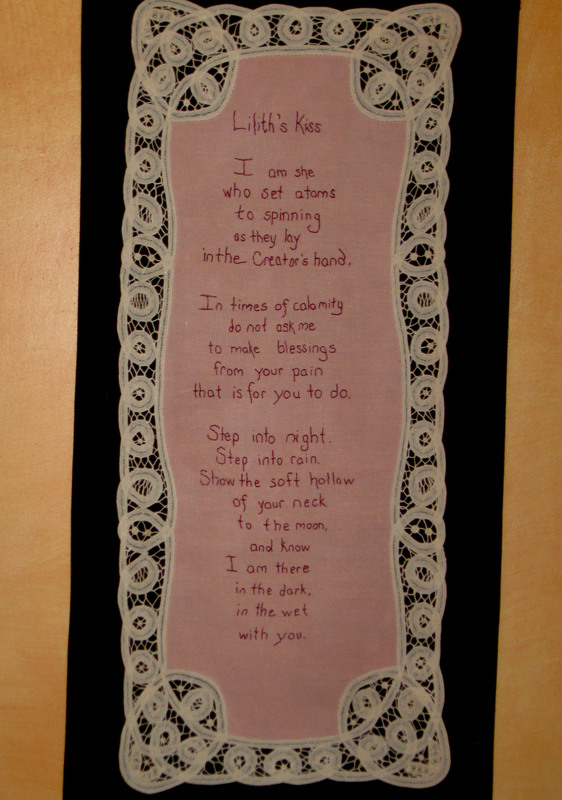 The poem was embroidered by Carrie Barracco, a talented fiber artist who has been with me for every step of The Linens Project. 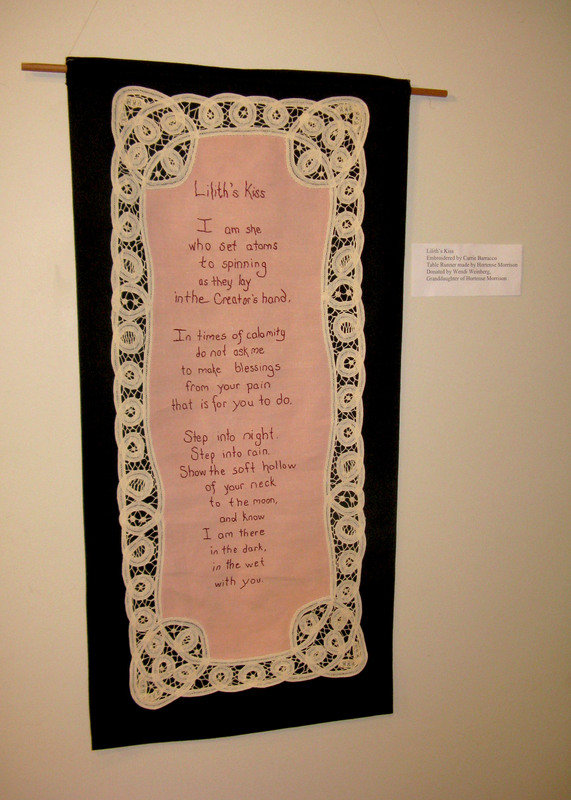 I asked Carrie to embroider this poem because I trusted her to honor the work of Hortense Morrison, and I knew she would do a beautiful job of embroidery. I also knew that Carrie would enjoy spending the time sitting with this poem/prayer. I love how the finished piece looks, thank you Carrie! As we stand in the dark of the year I have been struck by how much deep fear I hear in the world around me, and in the world at large. I wanted to write something for this solstice which spoke to that fear, and also spoke to our ability to survive. If you are reading this your very existence is evidence that the people of your blood line survived–and at some point I am confident that they survived far worse than what almost all of us face tonight. While this poem has not (yet) been put onto a linen, I wanted to offer it to those who read this blog and to those with whom they chose to share it. reminding us to remain afraid. and dawn is yet to come. a family of blood and a tribe of love. just beyond the clearing’s edge. flank her, their warmth holding off the thunderous cold. of her body, to live beneath uncertain skies. as the baby uses its lungs for the very first time. and a family would drop from the stream of time. and the future would be unwritten. holding a small, fragile body skin to skin. A new child of promise. let us also light the fire of memory. to the child of promise. so that the promise that is each of us could be fulfilled. while we raise our faces to greet the new day. I grew up going to Arlngton Street Church in downtown Boston, and for many years wanted to be a Unitarian Universalist minister. Several years ago my parents moved to Newburyport, and my mother joined the local UU church, The First Religious Society of Newburyport. 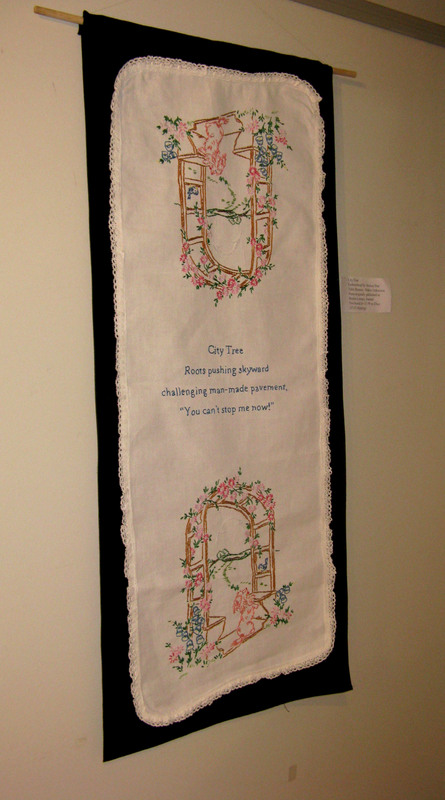 I feel honored that six of the pieces from The Linens Project are on display in the Tiny Gallery of the F.R.S. One of the things I love about the Tiny Gallery is that the church has taken what could have been wasted space, the area at the foot of the stairs from the sanctuary area, and created a sacred space. They have installed track lighting that can be moved to illuminate individual pieces of art, and artists are given a lot of flexibility in how they use the space. This is not a gallery tucked off in a corner, instead it is in a busy, highly trafficked area. Any time I have been there I have been struck but how people will be rushing through the Tiny Gallery and will suddenly stop for just a moment to look at what is on display. It makes me think of that moment of rest between the inhalation and exhalation of breath–a brief, but vital pause in the day. The day of the opening at the Western Mass RLC Alicia Brody from Greenfield Community Television interviewed me in my studio. Given how exhausted I was from getting ready for the opening I wasn’t sure how wise an idea that was, but Alicia did an incredible job with the material she got from our interview. She also filmed the reading that was done during the opening, and included Jessica Star “reading” (embodying is more accurate a description) my poem “Directions for Reading Poetry” in this segment. It was a joy to get to work with Alicia, and I hope we can work together again in the future. Finished Piece, ready to be hung! My husband wanted to be part of this project and taught himself how to embroider. This was his first piece–it’s a terrible picture, but it does give you an idea of what it looks like. He did a great job, and was a good sport when I handed him the baby pink floss…. Shortly after I began work on The Linens Project my life was shattered by exposure to toxic mold, which in turn pushed my symptoms from Lyme disease to where they were crippling. On good days I worked on this project—cleaning linens, writing drafts of blog posts, learning to embroider. There weren’t a lot of good days. But I believed in this project, and was determined to see it happen. It turns out I wasn’t the only one who believed in this project and was determined to see it happen. 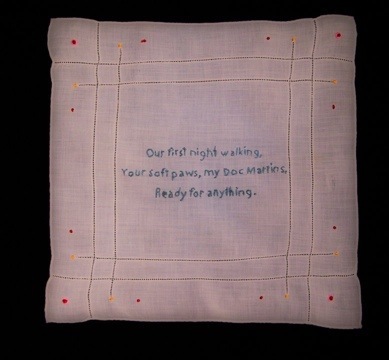 Friends asked if they could embroider a poem—which in and of itself was generous, but more so given that while most of my friends are artists, almost none had ever done embroidery. As the date for the opening of The Linens Project at the Western Mass RLC came closer I had a friend offer to write my press release—which a lifesaver given how confused I’ve been. Other friends have worked to help get the word out about the opening. So while the poetry on the linens is my work, and the vision is mine, this has become something far bigger than me. And I am both excited and humbled by how people have come forward to be a part of this project, and I see it continuing after this first show in Greenfield. I still have the almost finished drafts of blog posts about what has happened with this project, and I will be posting them as they are finished. Until then, here is the press release that Marianne Connolly wrote for the opening next week. Laura Gail Grohe is a poet with a passion for language and history. 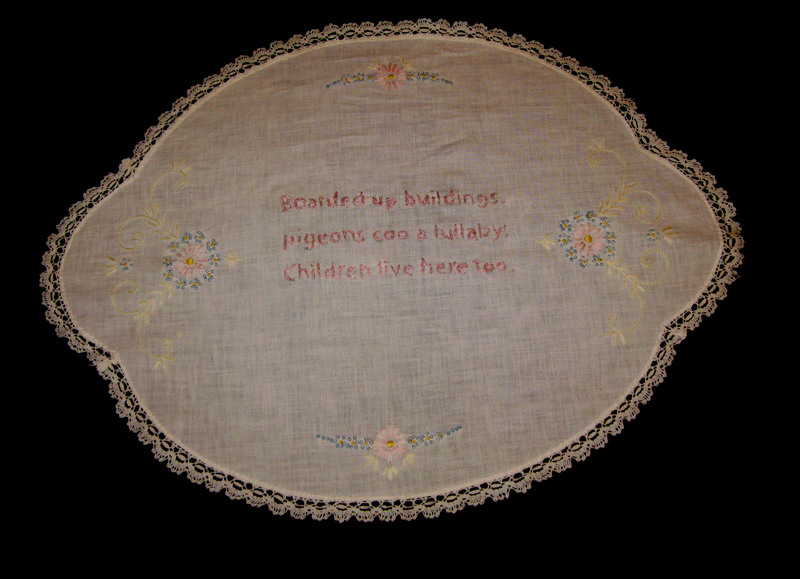 In The Linens Project she literally stitches those passions together by embroidering her poems on antique linens such as table runners, napkins and baby clothes. 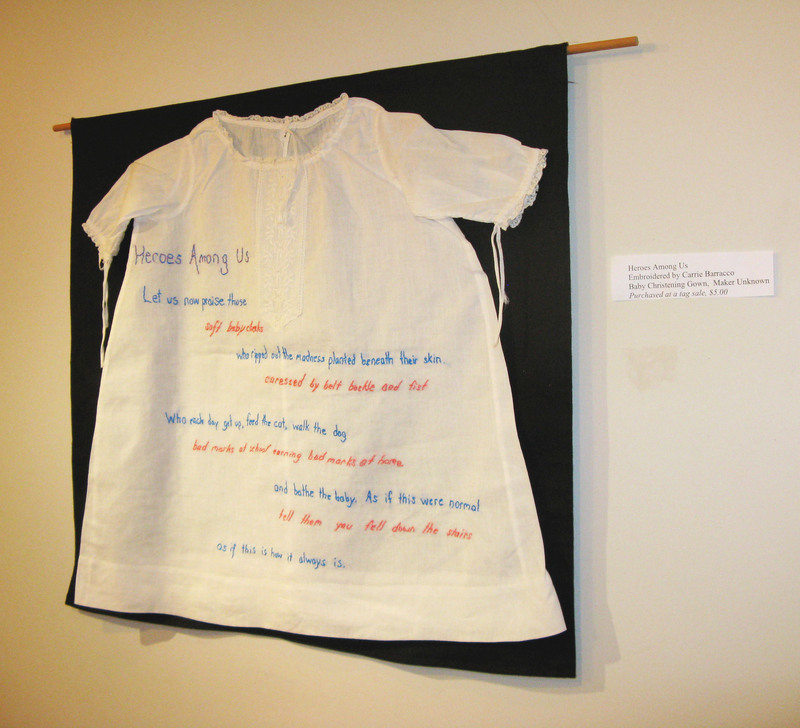 These compelling works are sometimes lyrical, like the love poem stitched on a table runner, and sometimes challenging, like the poem about abuse embroidered on a baby’s christening gown. Grohe collects her linens from junk stores and tag sales, finding it hard to leave behind a placemat or a handkerchief that has embroidery or handmade lace but is being sold for a dollar. 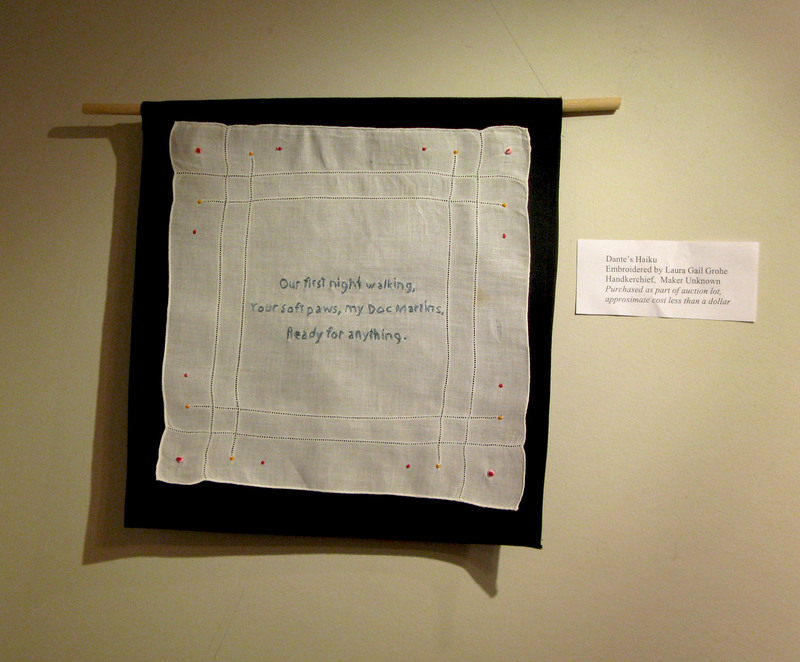 She repairs, washes, starches and irons before the pieces are embroidered, reflecting the labor of women in the past who worked on these same linens. Although she’s expert at intricate beading, Grohe wasn’t experienced with embroidery, and a team, including her husband and friends, worked with her on the series. On March 7, at the opening reception, many of those people will read the poems they worked with. The Linens Project is the final show in the “Life Systems” series, curated by artist Adrian Montagano. The series concept invited artists to explore the question: What do you see and experience in life that is not part of “consensus reality.” The exhibit will be at the Western Mass. RLC from March 7 through June 7, 2014. The opening reception will be on March 7 from 6 to 9:00 pm, with a poetry reading by Grohe and other area artists. made of dust and hope. we raise the new day. What Is the Linens Project? This project began with a poem. In 2010 I had the opportunity to take a week long workshop with Marge Piercy. At the end of the week she asked us what we could get rid of in our lives that was taking time away from our poetry. There was no judgement or blame in the question, but she was adamant about the need for each of us to answer the question for ourselves. In that moment, sitting in a room with 12 other extraordinary, committed poets it was easy to decide to jettison anything that distracted me from my poetry. Now, I love searching in junk stores for hidden treasures. And I have a lot of junk from those junk stores, junk that if I took the time to (fill in the blank) it would be returned to its former glory. It’s especially hard for me to leave behind something that has been hand embroidered or has handmade lace edging it when it is priced for a dollar. It almost physically hurts me to see that piece of fabric that someone has labored over for hours, being sold basically as junk. But even when I buy them I never did much with them other than wash them. I find an old shirt, stitched long ago, by a woman now dust. selling for less than the cost of her fabric. stitch the torn places, starch the collar. Do I value this shirt more than my poetry? worth more than the poems I could write? knowing its maker would approve. Flash forward two years. I had taken this poem to heart, and had narrowed my focus to poetry and beads (I work part time at a bead store). A friend and I were selling our jewelery at a church sale, and at the end of the day they were selling everything you can jam in a bag for a dollar. My friend knew I loved old linens, so she grabed the ones that were lying in with the Pez dispensers, chia pets without seeds, and other end of tag sale trash. A week later,, as I was ironing one of the now beautifully white place mats, I started to get mad at myself for loosing focus with my poetry, and in one of those moments that should involve a burning bush it hit me. The placemat was approximately the same size and shape as a piece of paper. I knew in that moment that I needed to put my poetry onto the linens I had collected. 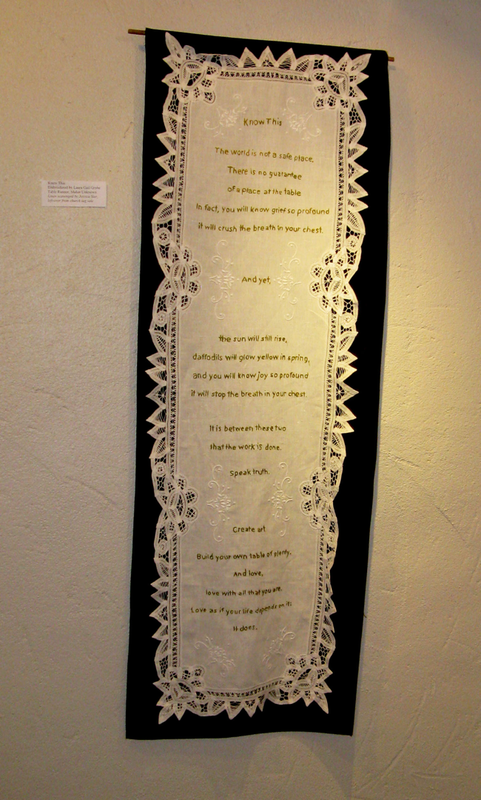 Initially I thought I would have other people paint or draw my poems onto the linens (my handwriting is atrocious), but it was made clear to me that to maintain the integrity of my vision the poems needed to be embroidered onto the linens. I did not know how to do embroidery. However, I do a lot of other handwork, and in particular I do intricate, labor intensive beadweaving. I figured I could learn to do embroidery. As I talked about this project with people I was surprised at the excitement it generated, and surprised that all kinds of people were excited by it, it didn’t matter if they read poetry or liked old linens, everyone wanted me to do this project. I was approached by two friends who were the curators of a juried series of art shows. They were familiar with my poetry and beadwork, and had heard me talk about this project. 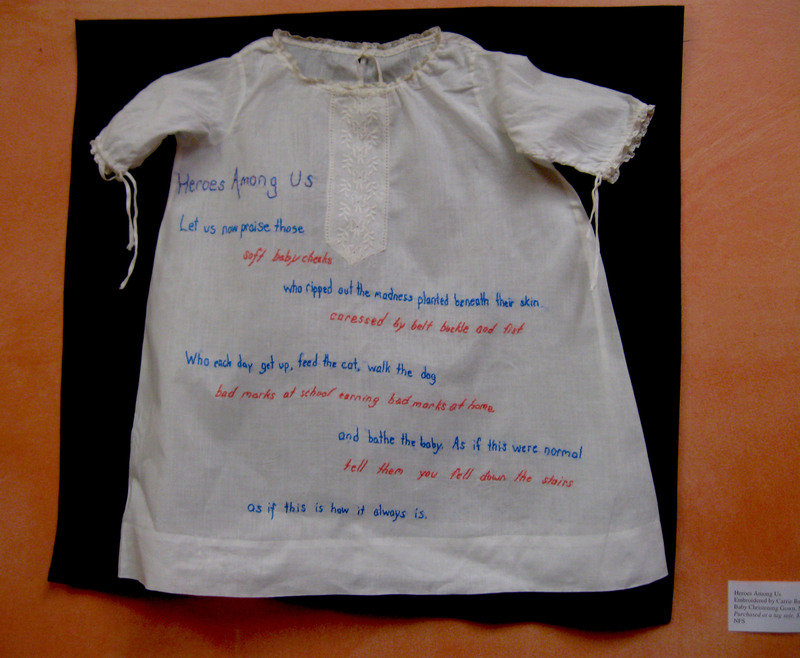 They asked me to submit a proposal to the series, even though I had not yet learned to embroider. They had that much faith in me, and they wanted to see my vision made real. I got into the series. And so it began.